The desktop 3D printer market has long been dominated by cartesian 3D printers, and all of the glitches, slipped layers and misprints that come along with them. While improved software and hardware have reduced printing errors in the last few years, the technology can still be frustratingly finicky. Linear delta printers offer slightly better printing reliability and repeatability, however they are plagued by the same hardware issues, the reliance on carrier rails for the movement of the print head. Because desktop 3D printers need to maintain constant tension on these carrier rails, they often need to be recalibrated, and parts wear out significantly faster. But a South Korean startup called LOCOOP believes that they have brought a new kind of technology to 3D printers that will improve the reliability, repeatability and the precision of desktop 3D printing. Rather than using standard delta 3D printer technology that operates the three arms with the same mechanism, the team at LOCOOP adapted Original Delta Technology, typically used in high-speed robotic assembly applications, to their new 3D printer, the LOCOOP Y. The three arms on the LOCOOP Y are controlled independently, which reduces the wear and tear on parts, improves accuracy, and prevents the types of misprints and layer slips that can often strike during large 3D print jobs. Each of the arms on the printer is operated independently, which reduces wear and tear and improves accuracy. Original Delta Technology has never been adapted for desktop 3D printing before, and LOCOOP believes that their printer is the most accurate and reliable 3D printer that can be purchased for less than $1,500. The startup is looking to crowdfund enough to launch the LOCOOP Y on Indiegogo, and after only a single day it has already pulled in more than 60% of its $50,000 goal. And the 3D printers are priced to sell, with the (now all gone) 50%-off-retail Super Early Bird price of $890. The Early Bird option is still available with a 45% discount off of retail at $990. There are also a bunch of options and add ons, including an extra print bed for $49, an extra extruder for $199 and extra rolls of filament for only $25. The LOCOOP Y Delta 3D Printer. The LOCOOP Y prints with a 50 micron layer resolution, and the printheads have magnetic joints so they can be swapped in and out within seconds. The printer can be controlled using its large front panel touchscreen, including printing directly from an SD card, activating the cleaning cycle, calibrating the printer and leveling the print bed. 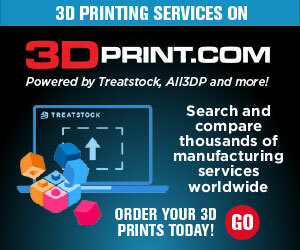 It includes a closed, temperature stabilizing print chamber that helps reduce misprints and layer adhesion issues. And it uses open source Cura 3D printing software so it will be easy to use on any computer operating system. Highly accurate 3D printed gears. According to LOCOOP they are ready to begin production on the LOCOOP Y just as soon as they have their final order numbers in. They expect that fulfillment could happen as early as December 2016 and they ship to backers from almost anywhere. Shipping costs range from $10 for backers in Korea to $90 for backers in North America and $130 for backers in Europe. Each LOCOOP Y 3D printer will include a 1 kg spool of 1.75mm filament, a 4GB SD card and a standard 100-240V 60W power adapter. Any crowdfunding campaign is always going to carry with it risks, so make sure that you’re comfortable with risking the backing amount before you pledge it. It is worth mentioning that LOCOOP is working with Intops, a well-established company that manufactures products like Galaxy smartphones, VR headsets and smart watches. Additionally, the Original Delta Technology is commonly used on industrial-quality manufacturing hardware, so this isn’t new or experimental technology. You can learn more about the LOCOOP Y on the Indiegogo campaign, and you can learn more about LOCOOP on their webpage. Discuss Further in the LOCOOP Y 3D Printer forum over at 3DPB.com.